Washington (AFP) - France's President Emmanuel Macron urged the United States to embrace multilateralism and warned of the perils of trade war and "extreme nationalism" in an address to Congress pushing back against Donald Trump's "America First" agenda. The French leader's feisty speech to lawmakers was a dramatic twist near the end of a three-day visit that had showcased his warm personal relationship with Trump, despite the gulf between their visions of world affairs. In one of his final appearances of the trip, he expressed pessimism about the future of the Iran nuclear deal, saying he believed Trump may end up pulling out of the agreement. The two presidents had literally embraced each other, repeatedly talking up their much-vaunted friendship during the trip, but in his speech to Congress Macron rigorously pushed back against Trump's trade, climate and non-proliferation policies. "We can build the 21st century world order based on a new breed of multilateralism, based on a more effective, accountable, and result-oriented multilateralism," Macron said, defending the rules-based world order. Trump has threatened to tear up international trade deals, scorns the United Nations, accuses US allies of not pulling their weight, walked away from the Paris climate accord and hates dealing with transnational bodies like the European Union. But Macron, who one day earlier had appeared hand-in-hand with Trump at the White House, received applause from the US leader's domestic Democratic opponents by calling for a "strong multilateralism" and avoiding an isolationist approach akin to "closing the door to the world." He declared that France would not pull out of the Iran nuclear deal, warned against imposing trade tariffs on allies and stressed that global action on climate change is vital because there is "no Planet B." "The United States is the one who invented this multilateralism. You're the ones now who have to help to preserve and reinvent it," he said, in a tacit nod to Trump's efforts to shake off international shackles. In doing so, he flipped the script of the trip -- the Trump White House's first full state visit -- which was until now dominated by intimate images of the French and US first couples planting trees, exchanging kisses and socializing. Trump at one point brushed Macron's shoulder and said: "He is perfect." 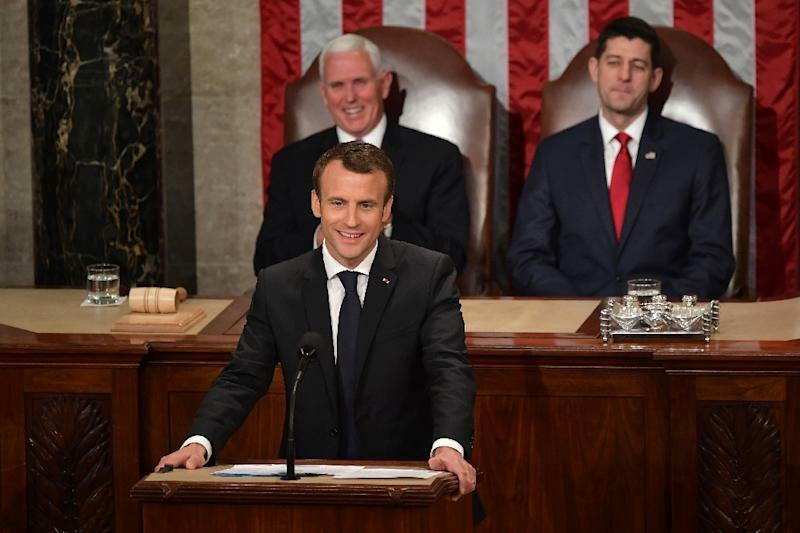 Transatlantic political reality reasserted itself Wednesday, however, as Macron -- speaking in an accented but increasingly confident English -- recalled the glories of past US-French cooperation. Trump's trade sanctions against European steel and aluminum will enter into force in coming weeks unless Trump agrees to sign a waiver. Despite his affection for Macron, he has not yet said he will do so. "We need a free and fair trade, for sure," Macron said. "A commercial war opposing allies is not consistent with our mission, with our history, with our current commitments for global security." Trump has also warned he may not renew sanctions waivers on Iran next month, which would effectively torpedo the 2015 nuclear deal, a triumph of multilateral diplomacy. Macron has more sympathy than perhaps any other foreign leader for Trump's arguments that the deal falls short of sealing off Iran's alleged quest for a nuclear weapon -- which the French leader vowed before lawmakers that Tehran would "never" be allowed to possess. But after his meetings with Trump and his speech to Congress, Macron told reporters that while he had no "inside information" on what Trump will decide, he believes the US leader "will get rid of this deal on his own, for domestic reasons." Together with Trump, Macron called Tuesday for a more comprehensive "new" deal with Tehran, but made clear to lawmakers that France would not be walking away from the existing accord. "We should not abandon it without having something substantial and more substantial instead," he told Congress. Several Democrats said they were impressed by Macron's impassioned call for US engagement on multiple fronts, particularly on climate change and Iran. House Democrat Adam Schiff judged that Macron had offered "more of a direct contradiction of the president than I was expecting." "There were more than a few uncomfortable moments on the GOP side of the aisle," he told AFP. But Republican Majority Leader Kevin McCarthy said he didn't feel Macron had rebuked his host. "He said in there that he believes in free and fair trade. That's exactly what the president asked for," McCarthy said. Macron's provocative speech came after he enjoyed an exuberant welcome from the Republican president -- an elaborate state dinner, an intimate get together for four with their wives at George Washington's Virginia estate Mount Vernon, and repeated vows of friendship. The 40-year-old French leader spoke at length of "how deep, how strong, and how intense the relationship is between our two countries," and marveled at the unforeseen rapport he has forged with the 71-year-old Trump. But while the "bromance" has provided plenty of material for late night TV comedy, the key question is whether Macron can translate the privileged relationship into concrete results -- be it on trade, Iran or the climate. After his Congress speech, Macron addressed students at George Washington University, where he pledged to help "win peace" in Syria by defeating Islamic State extremists in the war-scarred nation. He also spoke of the "tremendous challenge" facing America's younger generation as it grapples with global issues like climate change and geo-politics, but offered words of encouragement. "At the end of the day you will be the ones to decide," he said.